John Rea is a Partner and the Vice-President/General Manager of MDI Electrical Construction. John has been with MDI since 2004. He brings over 27 years of experience to MDI. John is responsible for several administrative functions including sales strategy and solutions, estimating, and field operation initiatives. He has played a lead role in implementing new project management methods along with enhanced procedures for cost savings and project accountability. 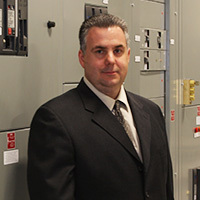 John’s experience and expertise includes all aspects of data center, commercial, & retail construction with a specialty in data center/mission critical infrastructures that include the design of data and fiber optic systems, AC & DC power installations, advanced power generation, and UPS installations. John graduated from DeVry University with a degree in electronics. He is also a graduate of the IBEW 134 apprenticeship training, a Licensed supervising electrician with the City of Chicago, a Licensed IL & IN real estate broker, a BICSI & LEED corporate member. Prior to joining MDI Electric, John worked for a Chicago based electrical contractor for 13 years in a wide variety of capacities, including estimating, sales, project management and operations.